Mcdonalds has a new promotion! 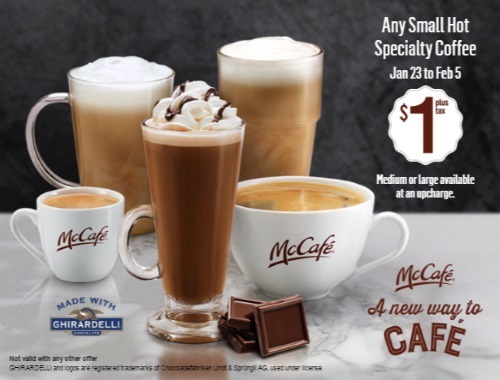 Get any McCafe small hot specialty coffee for only $1 plus tax. Medium or large available at an upcharge. The offer applies to McCafé latte, cappuccino, Americano, single shot espresso and, for chocolate lovers, McCafé mocha made with Ghirardelli chocolate. Available at participating McDonalds restaurants in Canada. This offer is valid January 23-February 5, 2017. Click here for McDonalds coupons.